The fire was zero percent contained as of 11 p.m.
More crews were arriving to battle the destructive and fast-moving Blue Cut Fire through the night after the blaze charred more than 28 square miles Tuesday alone, forcing the closure of the Cajon Pass, and burning structures with no end in sight. 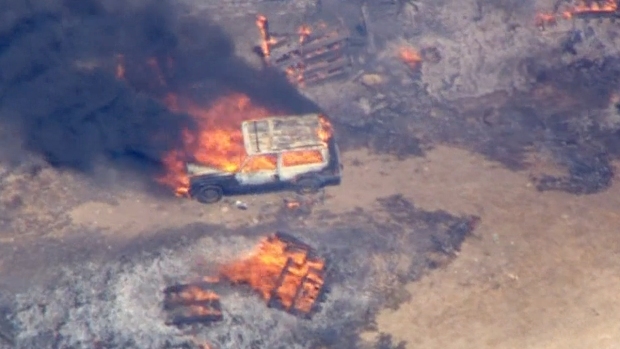 The devastating blaze came as a punishing summer heat wave swept across Southern California. 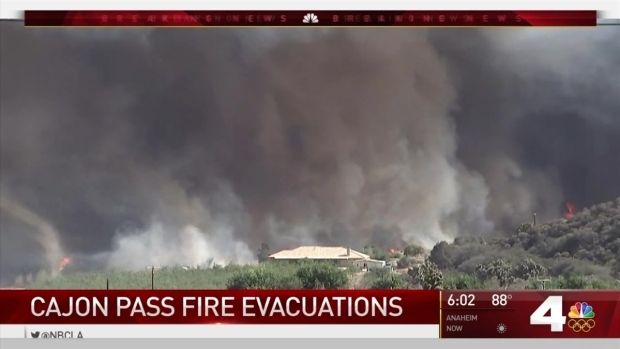 By Tuesday evening, 82,000 residents were under mandatory evacuations and Gov. Jerry Brown declared a state of emergency. 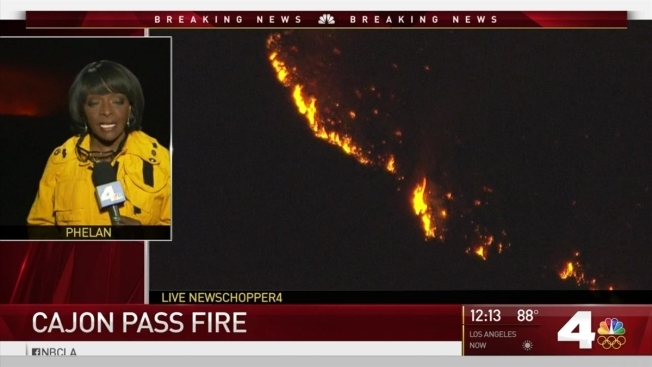 The fire was zero percent contained at 11 p.m. PT, according to CalFire. The so-called Blue Cut Fire, named because it started near a trail called Blue Cut, erupted at 10:36 a.m. Tuesday in the Cajon Pass near Kenwood Avenue west of Interstate 15. A monstrous fire destroyed multiple structures and led to the evacuation of tens of thousands of people along the Cajon Pass. Watch raw video from Tuesday, Aug. 16, 2016. Nobody was seriously hurt, but the fire left two firefighters with minor injuries. Two firefighters were hurt when they became trapped by fire while defending homes and assisting evacuations in the Swarthout Canyon area west of the Cajon Pass. They took shelter in a home, but were briefly hospitalized and returned to the fire line defending structures. Ash rained down from above as motorists snapped pictures and videos of the large black and gray plume rising above the Cajon Pass. Smoke could be seen in Big Bear Lake. At least eight communities were under evacuation orders, affecting 82,340 people, according to fire officials. The entire community of Wrightwood was forced to evacuate Tuesday afternoon, and by nightfall, the evacuations extended to the edge of Los Angeles County. Up to 800 people evacuated Lytle Creek, a community along the eastern edge of the San Gabriel Mountains. One resident who only gave NBC4 her first name, Amber, said she was in the shower when deputies knocked on her door in the Happy Jack community and asked her to evacuate. She grabbed what she could, including her dogs, and took off. But she said her neighbor refused to evacuate and remains in her house. Communication is sketchy in the area. "There is no escape," she said. "This was the time for me to go." The blaze closed the main route to Nevada as the 15/215 interchange was shut down. The fire shut down both directions of Interstate 15 from Oak Hill Road to Kenwood Avenue, Caltrans reported. A photo from a motorist showed a line of vehicles sitting on a stretch of highway under a red, apocalyptic plume. A video on Instagram showed cars and semis stranded on Interstate 15. A cement truck can be seen driving in reverse. Highway 138 to Lone Pine Canyon was closed. A video by a newspaper reporter showed flames approaching State Route 138, which runs east-west along the northern foothills of the San Gabriel Mountains and the Mojave Desert. 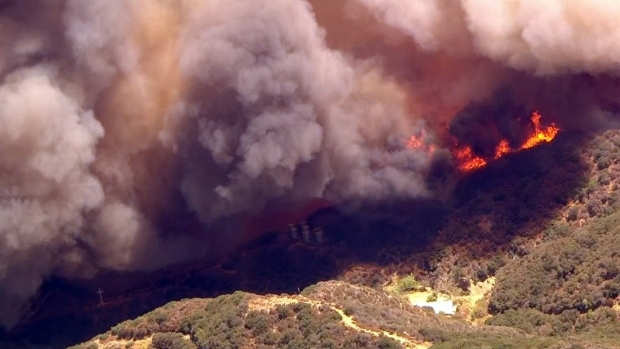 Residents in the Lytle Creek area are on edge as the Blue Cut Fire rages in the Cajon Pass. Mekahlo Medina reports for the NBC4 News at 6 on Tuesday, Aug. 16, 2016. The fire disrupted the first day of school for many in the region. Students at Kimbark Elementary School were being transported to Cesar Chavez School in San Bernardino. Snowline Unified School District also evacuated student to Wrightwood Elementary School. Any parents who could not pick up their children by 3 p.m. would be reunited at Serrano High School. Bus routes were canceled in Wrightwood and the West Cajon Valley for Snowline Unified. Any students who were aboard buses on the route would also be taken to Serrano High School. Red Cross emergency shelters were set up for evacuees at the Jessie Turner Community Center, 15556 Summit Ave., in Fontana, and also at Sultana High School, at 17311 Sultana St., in Hesperia, which has become the designated overnight shelter. A shelter for large and small animals can be taken to the Devore Animal Shelter, 19777 Shelter Way or the San Bernardino County Fairgrounds, at 14800 Seventh St., in Victorville. BNSF Railway Company also halted train operations through the Cajon Pass Tuesday due to the blaze. The fire is raging during an extreme heat wave and a historic drought and when a red-flag fire warning and an air quality alert was issued for the area. 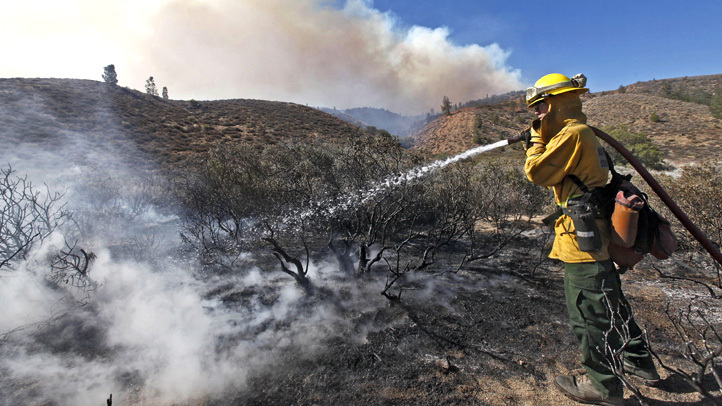 The number of fires in the state has grown 20 percent over the last decade, going from more than 4,800 fires in 2006 to nearly 5,800 fires in 2015, according to data from the California Department of Forestry and Fire Protection.